There was more unfortunate news at Harworth colliery (North Nottinghamshire). The sole producing face in the Deep Soft was stood down from production at the beginning of July 2005 for several weeks due to excessive floor lift and crush. The face at about 6’ 6” (2.00m) thick was higher than the gate. Weighting and floor lift was tremendous and the stage loader became trapped. The plan was to rip the roof (supported on roof bolts) and also dint the floor and set legs and girders in front of the retreating face to allow production to recommence after the pit holiday in July. Of course legs and girders was the traditional method of support in the past from time immemorial up to the early 1990s when roof bolting and meshing became the norm! Development work was also stood following the ending of the contract with the private mining firm AMCO who had taken over and employed about 30 men at the pit. Due to the pit standing, the opportunity to change the winding rope on the 1,000m deep coaling shaft arose and the 4 day programme would be finished before the scheduled time chosen in the pit holiday towards the end of July 2005. Coaling re-commenced very steadily about 11th August 2005. The announcement on 18th July 2005 that Harworth (Nottinghamshire) would be closed was no surprise to me. Supposedly it was to be mothballed after Christmas until more favourable terms were available. Men and Officials were being offered jobs at Welbeck, Thoresby and Daw Mill. By September 2005 some 80 odd men had been transferred to Thoresby and Welbeck. Some were to stay to work the face and would probably be transferred in the New Year. Paddy Tipping MP pressurised Energy Minister Malcolm Wicks into meeting Colliery representatives re the position of the requirement of £50m to access a large area of the Barnsley (Top Hard) seam reserves, (closed previously in 1984). 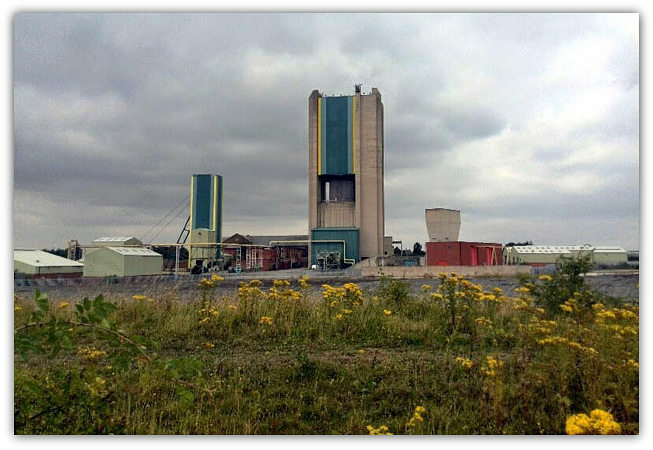 Rossington, in South Yorkshire, nearest neighbour to Harworth in Nottinghamshire had been plagued with bad geological conditions and a yo-yo production from the Barnsley seam where 7 miles of cutting, 35 strips produced 20,745 tonnes in June, but the face which started in March 2005 needed to produce 24,000 tonnes from 40 strips a week to maintain target. Over 165,000 tonnes of production was lost in that period. 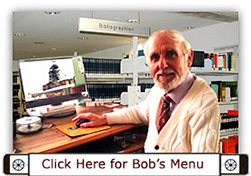 By September 2005 Rossington was to be mothballed also. 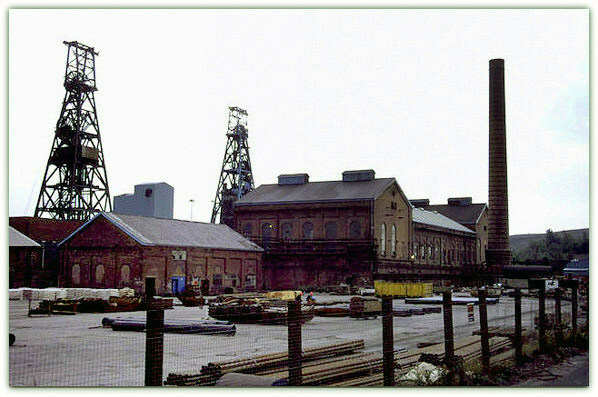 A further blow was the big hitter Daw Mill (Warwickshire) where production was stopped again due to a fall in July 2005. Output in 2004 was 3.0mt and 2.0mt in 2005. At the end of September it was stated that 15 Nottinghamshire schools were converting their coal-fired boilers to a system called Woodheat, which runs on sawdust pellets or woodchips. Neil Greatrex President of the UDM stated that it was further disappointing news for the coal industry, but Friends of the Earth campaigners were pleased, as it was a positive step towards reducing pollution. An article by Peter Featherby stated that in August 2005 a Labour Government working party recommended that Planning Authorities look favourably on schemes which use energy created using biomass fuels, because the form of energy production is carbon neutral. Plants absorb carbon dioxide from the atmosphere as well as energy and when burnt in a biomass plant they generate only the amount of carbon dioxide that they received. At present transport carrying bulky material to the energy plants is an objection. Again this is fuel that could and will replace coal in the future. A massive area in Canada is mining oil sand, yet another find for oil and another reason not to mine coal to supply our energy needs. The oil shales of Scotland were tried in the past, whereas the oil shales of the Peak District on Kinder Scout lie waiting, albeit in an area of a National Park..but ! 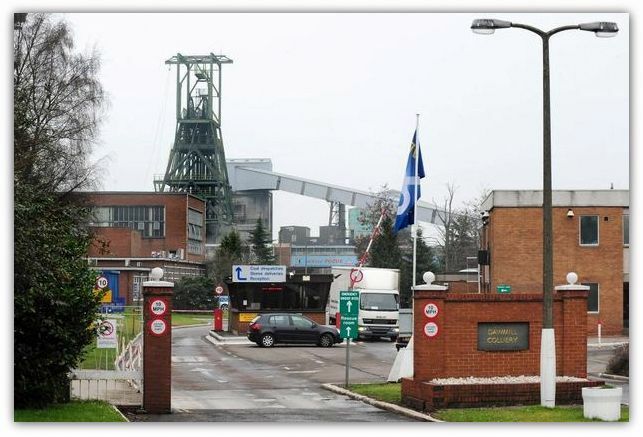 English Partnerships, the National Regeneration Agency published a paper outlining the things achieved in the Coalfields since the demise of the industry. Meden Valley which straddles Derbyshire and Nottinghamshire is one of the worst areas affected by the closure of the pits in the 1980s and 1990s. Following the closure of the mines many jobs were lost and subsequently had an effect on the housing where the employees lived. With reference back to 1998 when the Coalfield Taskforce had highlighted the problems of the area mentioned, a joint venture was launched involving English Partnerships, Bolsover and Mansfield District Councils and the East Midlands Development Agency. John Prescott Deputy Prime Minister (New Lab) performed the start of the project in March 2003 it was named Meden Valley Making Places (MVMP) Ltd. Some 101 sites were to be managed by English Partnerships under the National Coalfields Programme (having a budget of £386.5m), working with Regional Development Agencies, the Coalfields Communities Campaign, Coalfields Regeneration Trust and other partners. The project is to create 42,000 new jobs, build new homes, commercial buildings, and new use for some 4,000 hectares of former colliery land. At present the East Midlands team are working on 16 sites across the Region, e.g. Ollerton and Shirebrook to name two. Housing at Creswell model village has been renovated and other villages are earmarked for similar things. 62 former British Coal houses at Calverton, originally built for the workforce there, among 600 sold to the Leicester Housing Association in 1988 for £14.6m, have finally been refurbished at a cost of £1m. The Conservative Government put a ban on any grants being handed out to improve those 10 years ago but the ban was lifted in 1997 when a New Labour Government was elected to Parliament. Alterations include new windows, indoor toilets, central heating and cupboards. However the mine finally closed in 1999 after re-opening in 1994. A ceremony to commemorate the life of Calverton colliery (Nottinghamshire) was held on Saturday 10th September 2005. 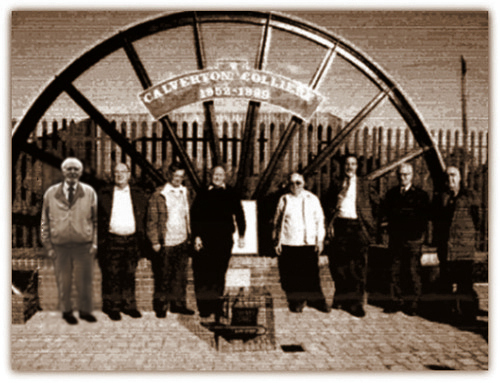 A half-winding wheel with the dates 1952-1999 was erected opposite the Miners Welfare at the top end of Calverton village. Albeit that it was a very rainy morning the event was well attended and a buffet was arranged in the Welfare extension hall for around 150 guests. The driving force behind the scheme was Mick Lloyd an ex Official at the colliery. I was invited to the ceremony, as an ex Senior Surveyor for British Coal, having supplied information and plans of the mine which was displayed for interested parties. On my suggestion Charles Whyte an ex Surveyor at the mine in the 1950s, and later Deputy Area Surveyor for South Nottinghamshire then Chief Surveyor for North Nottinghamshire and Nottinghamshire Area, accompanied by his wife was invited also. They had lived in the village at one time. Another guest was Bill (from Bulwell) Cross, an ex sinker of No2 shaft. Bill Denton (an ex Colliery Manager at Bolsover and Assistant Undermanager at Ollerton whilst I was Surveyor) attended as representative for the Coal Authority. A Time Capsule covered with an engraved polished brass plate was buried into the brickwork. Some information and plans supplied by me and other memorabilia from other sources were enclosed as a reminder of the colliery in years to come. The ceremony of sealing the capsule was performed on 29th October 2005 under a cloudless blue sky by Jim Tatters. Paddy Tipping MP (Lab) was in attendance. I attended the ceremony the week previous but on that occasion it rained incessantly and we all had rain dripping off the end of our noses. New Houghton as a reminder of Pleasley (albeit that the headgears and engine house and one brick chimney have a Grade II preservation order and currently being restored). Harworth and many other sites (including Bilsthorpe finally in 2015). Difficulty in finding suitable sites for 2 half wheels at Ollerton and a half wheel that I scrounged from Welbeck demolition for Bilsthorpe have met strong opposition from the Tesco store at Ollerton from siting the wheel at the entrance to their store on the site of Ollerton colliery closed in 1994 and Harworth Estates at Bilsthorpe where again refusal to erect the half wheel at the old entrance to the pit (closed in 1997) has been refused permission as it is now an industrial estate. The saga for both pits was still going on in 2014. It is an absolute disgrace. Both villages would not exist had it not been for the pit being sunk there. I am involved in both projects and my patience has just about disappeared. I met Mark Spencer MP (Con) Honorary President of the Bilsthorpe Heritage Society and Shaun O'Brien of Harworth Estates (having spoken to him by phone to arrange such a visit) with Trevor Goodman and George Cooper, Chairman and Deputy Chairman of Bilsthorpe Heritage Society to hammer out a position for the half wheel at the end of the Lane. Finally at the meeting on 4th October 2013 it was agreed that a bit of hedging could be removed on the main road and the half-wheel still languishing on the Sports field, after 3 years, could be erected there. Reminders of the industry such as old mine cars or steel tubs are to be found in various parts of the 3 counties as well as outside the Rescue Station, Mansfield Woodhouse, the traffic island at Stanton Hill and on the A60 road in Warsop and bronze statues of miners at the ring road in Mansfield and on top of the tip at the closed Silverhill colliery.